Mycena ‘Nile River’ seen glowing in the dark. Photo copyright Dougal Townsend. Letting our eyes fill up with darkness, we start to trust our feet and hands to find our way. We’re adjusting to the blindfold of true night: no torches, no phone or camera screens. We have purposely chosen a track with a dense canopy overhead to curtain off the moonlight. We shuffle about below. We must slow and compact all our movements so as to avoid tripping or bumping into a tree, or each other. For the hundreds of years of human habitation in Aotearoa/New Zealand, people have been seeing spirits in the forest at night. The indigenous Māori hand down stories of patupaiarehe, pale fairy-like beings whose description varies from region to region, but who are typically known as forest-dwellers afraid of the light, who come out only when it’s dark. And when Europeans started colonizing the place in the 19th century, they too found mysterious nighttime forests inhabited by luminous numina. In the Taranaki region in 1843, the natural historian Ernest Dieffenbach wrote that when darkness fell, “we seemed to have entered the illuminated domain of fairy-land”1. The same lights he saw – but in the lower North Island – caused another colonist, William Colenso, to “fancy all manner of strange outrageous and mocking spectral or demon faces” 2. The patupaiarehe legends have many interpretations, but as for Dieffenbach and Colenso, we know that they were referring to glow-in-the-dark fungi3 – Colenso noting that he had “not infrequently met with such luminous vegetable substances” in this country. Fast-forward almost 200 years and, like much of the planet, Aotearoa has been both heavily deforested and significantly brightened by artificial light. Yet in pockets of reserve native forest, where we can escape from light pollution, some of us have recently been rediscovering ‘fairy-land’. The mushrooms come in at the edge of your sight at first. Nature’s night-vision goggles, the rod cells which are more densely clustered away from the center of human retinas, help us perceive the simple fact of light, rather than any kind of hue. Thus when you first see bioluminescent mushrooms, you see a faint white glow with your peripheral vision. The eye cells that see color and detail take much longer to adjust to the gloom. Doubt follows. When you turn your head to face the source of the light, it disappears because you have turned your peripheral vision away. Or did you just imagine the ghostly whiteness you thought you saw? Writing in his journal in 1841 in the Far North region, Colenso mentioned seeing decaying timber “shining with such a peculiar silent luster, (if I may so speak) in the depths of the forest”4. He knew he was mixing metaphors, for how can a luster be silent? But it was a good grasp at describing the way fungal luminescence seems to whisper to the eyes. So summoned, you then shuffle nearer to inspect, being forced initially to keep cocking your head like a giant hen to be certain of what you have found. The first time I joined a night search, near Gisborne in 2013, the party came across a glowing member of the Mycena genus, which is known to have dozens of bioluminescent species worldwide. Until then, however, Western science had not formally identified any glowing mushrooms in this country at all. day, and by night. Photo copyright Taylor Lockwood. M. ‘Crystal Falls’ 5 was initially seen in that dark forest as what looked like white wands hanging in midair. This was the effect created by the fungal organism, or mycelium, growing and glowing on the spines of dead fern fronds still attached to their trees. When we moved our bodies into the next zoom level, and once our eyes could take in the sight, we also noticed this fungus had teensy mushrooms fruiting, and they too were lit up. Since 2013, at least six other glow-in-the-dark species have been documented in this land: three more Mycena, two Armillaria, and one undescribed species that may be a Hydropus. No two of these “bioluminesce” the same way: sometimes the mycelium doesn’t glow and only the mushrooms do; often just parts of the mushroom, such as the stems or the caps glow; in one case (Mycena ‘Taranaki’), it’s only the mycelium that glows and not the fruitbodies, creating a beautiful mushroom shadow play. Many of the recent finds in our forests have been made by the American photographer Taylor Lockwood, who says he has an ‘inner lumacy’6 as he now roams the globe on a quest for bioluminescent mushrooms. He has taken striking photographs and helped document these beauties in at least seven countries including New Zealand. In May last year – the southern autumn – another nighttime expedition took place and added a couple more species to the count. Six of us, at Lake Brunner in the South Island, entered the forest mainly with touristic intent. I had looked along the track by day and found M. ‘Crystal Falls’ growing on tree ferns, and now brought back a mixed group of scientists and enthusiasts in the hope of seeing it glow by night. M. ‘Crystal Falls’ turned out to be the least astounding of the things we saw. Every ten meters or so, something different would emerge from the black. Despite not being a drug taker, I repeatedly had to check with myself this was not some kind of hallucination. One species (thought to be Lockwood’s Hydropus) was fruiting in such abundance and had small stems that glowed so brightly, you could use a dead branch covered in it as a beacon to let others locate you. We found a flush of a species not previously known to glow, Mycena ‘Nile River’, whose whole fruitbodies radiated softly. I think of Mycenae as the most ‘normal looking’ mushrooms: cap, gills, stem, nothing weird about them really. So when the whole thing glows it’s kind of the quintessential glow-in-the-dark mushroom look – and accordingly, we each in turn lay on the ground and hovered our faces in front of their fern-stump home to absorb the spectacle. One of the highlights of my life was noticing what I will call an actual ghost on the forest floor. I had shuffled into an area that appeared to be all blackness and was gazing down at the approximate vicinity of my feet. I detected what could have been a dapple of moonlight on a leaf and bent to pick it up. Since the moonlight moved with my hand, I knew it was not a dapple at all but a glowing, decaying leaf. A fungus had colonized and consumed this leaf, and in doing so had taken on the leaf’s form, and was now emitting light with the energy it had got from eating the leaf. If a ghost is the remnant energy and/or outline of a thing that is dead, then this is precisely what I was holding in my hand. A leaf ghost. Now I too was seeing spirits in the night forests of New Zealand. There’s a certain sad irony that most glow-in-the-dark mushroom sightings today will be via a computer screen, and after the fact of a digital camera’s tricks. For one thing, the technology reveals a lurid green glow that may be some kind of scientifically accurate or ‘true’ color – but I’m not sure I recall ever seeing it in real life, even once the eyes have fully adapted. I remember something much softer: white to pastel-green emissions that slowly dawn on you, gradually assuming their mushroom forms. It’s like being let in on a secret. You can definitely get a sense of the magic through photography, and it’s great that it can be shared so widely through this medium. But I also hope the digital imagery impels those who can to go exploring outdoors at night to experience this natural wonder – and motivates us to protect that experience, with forest and dark sky preserves around the world. With thanks to Geoff Ridley, whose Spores, Moulds and Fungi blog pointed me in the direction of Dieffenbach, and to Melissa Bryant who steered me to Colenso. Dieffenbach, Ernest, Travels in New Zealand [Vol.I], 1843 [Capper reprint, 1974], Part I, Chapter VII, (under subheading “The Sea-Shore”). 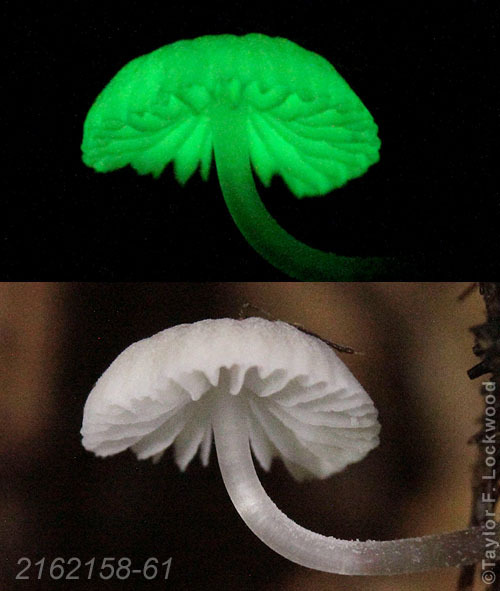 Both identified what they saw as ‘phosphorescence’ in rotting timber, but fungal bioluminescence is now known to result from a chemical rather than a physical reaction (whereas phosphorescence is the re-emitting of absorbed light). Species that haven’t yet been given a full Latin name are often tag-named with the location where they were first found.